Taking January to rest, reflect and rejuvenate was a REALLY good idea. 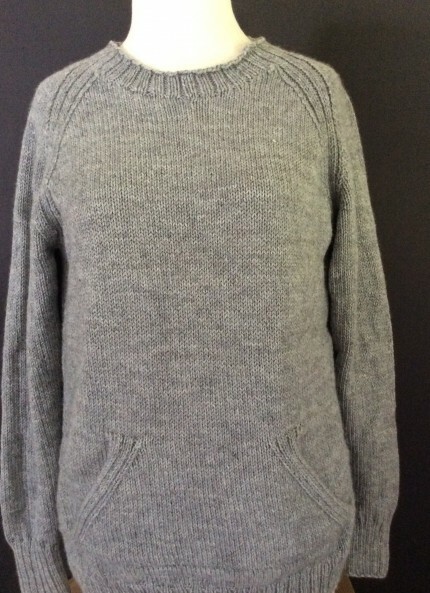 I did a little bit of work (knit this Stella sweater for Green Mountain Spinnery) but didn’t subject myself to insane deadlines. One of my biggest projects during the month was to get a handle on my personal knitting queue and stash. It had felt enormous and a bit overwhelming, but the organization process helped me see it wasn’t so bad. To start I pulled out all the projects in progress. 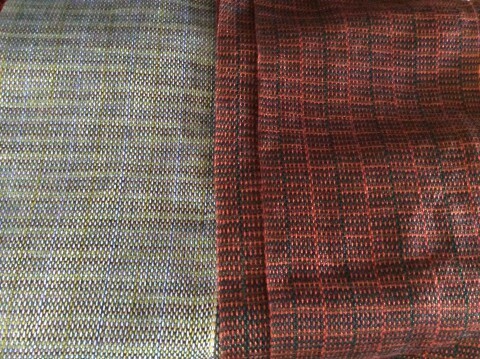 Three scarves/wraps suitable for travel knitting or social settings. One wrap with really complicated charts. One sweater just barely started and one sweater lacking just a sleeve. I finished knitting the one-sleeve sweater (Meris) and blocked it. It just needs the buttons sewn on to be ready to wear this spring. I finished the shawl that was 95% done (Hillhead). The two remaining easy projects are bagged up and ready for road trips or knitting group so I’m not worried about finishing them. That complicated project I wrote about a year ago. I wasn’t loving the yarn I’d chosen and couldn’t decide whether to keep going or not. Apparently I spent a whole year not making a decision. So I hauled out the project, figured out where I was and started knitting. A few rows in I remembered why I was unhappy. The pattern calls for a tightly spun and plied yarn and I had one that was loose. This is what happens when you pull yarn from the stash in a hurry because you want a project for vacation and you are leaving right away. It wasn’t a great match and I knew I wasn’t going to be happy either knitting it or wearing the garment. So, finally, I have ripped it out and replacement yarn is on my shopping list. Next up was the pending projects list. These are patterns for which I already have the yarn and I just need to decide when to start. Since I finished a sweater I was ready to add a new one to the works-in-progress list. The one other in progress has the occasional complicated bit but is mostly an easy knit. the new one has lace panels and will require some concentration. I’d swatched already so this was ready to cast on. So that’s two sweaters (one easy, one requiring more attention) and two wraps on the needles. Since I have new commissions, this is more than enough for my limited personal knitting time. The project I didn’t tackle was the inventory of “yarn for which I have no project in mind.” Turns out this is the one producing the most angst. I can see most of it (I have open shelving), so it isn’t that it’s unknown. But I’d like to match more of it up with patterns and have a plan. One of my regular clients sent a box with 4 knitting projects, and I’m expecting yarn for a sweater commission any day now. 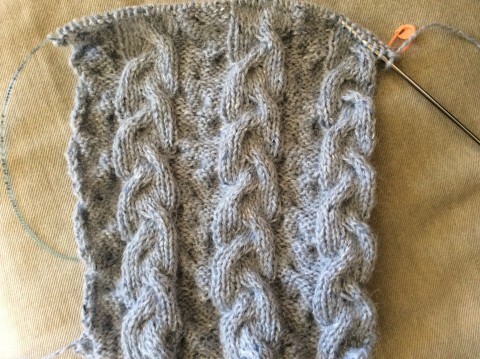 I’ve already started one of the 4, a cowl, and I’m using the 1:1 allover rib pattern to become faster in continental style knitting (left hand carries the yarn, right needle picks it), and using Norwegian purl to avoid flipping the yarn front to back. 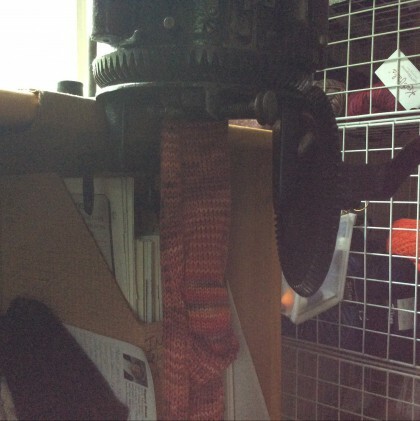 I’ve got the sock machine cleaned and I’m ready to put the needles back in. 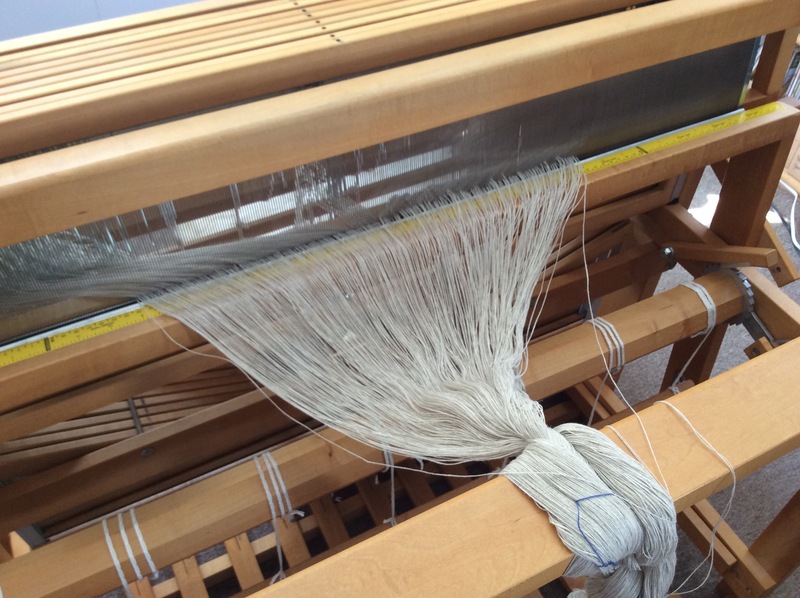 And my empty loom is calling me. 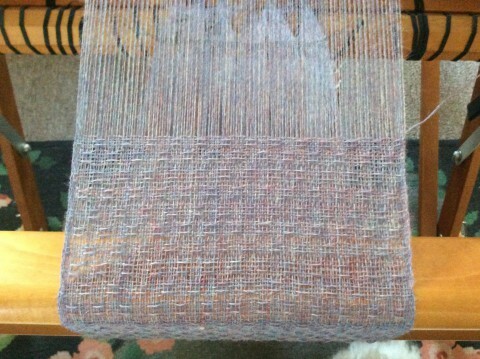 I have a scarf warp all wound and ready to be threaded. It’s been waiting since mid-December when I thought I’d get just one more scarf done before the holidays. Rested now, I can’t wait to get started. Here in the northern hemisphere where June means summer weather you wouldn’t think it would be the time to get cozy in a comfy chair and hunker down with knitting. And that 90 degree day last week, not so much. But then we had a spate of chilly. 40s at night, cooler in the daytime. A storm came through and dropped much-needed rain. We’re clawing our way back to warm and I can’t wait. But the cooler weather makes an excellent backdrop for achieving progress on my knitting queue. I’ve been working on little slipper socks for a client. 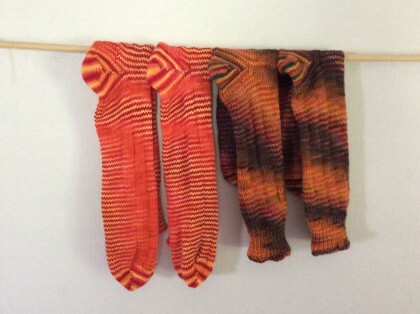 I have one more pair to finish and then I’ll move on to a scarf project. 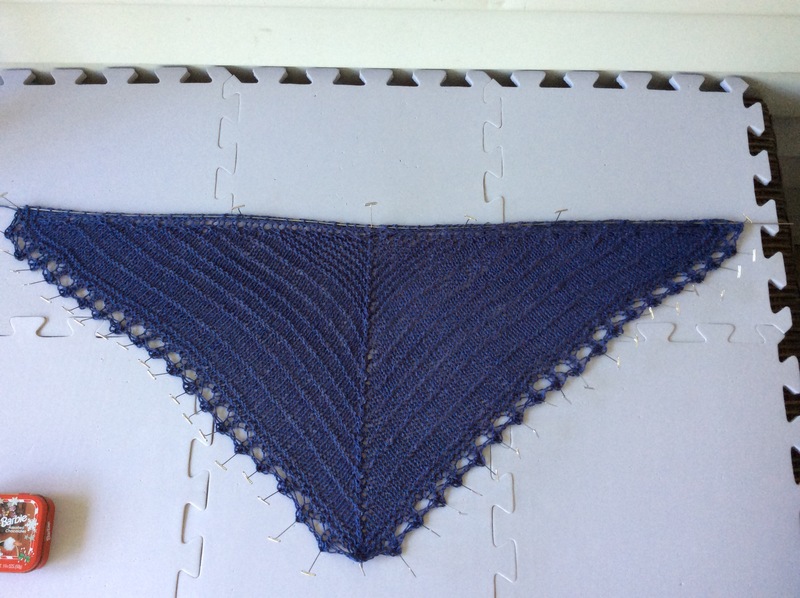 I did the gauge swatch earlier in the week so it could be blocked and have time to dry for accurate measuring. 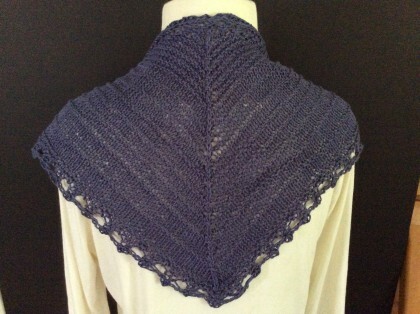 The yarn is a blend of Suri Alpaca and Merino and really soft. That chilly day when the rain came through I had it wrapped around my shoulders and it was just the thing to keep me from turning the heat back on. It is so satisfying to turn a “ball of string” into something beautiful and useful. Whether knitting or weaving the transformation is just magical. 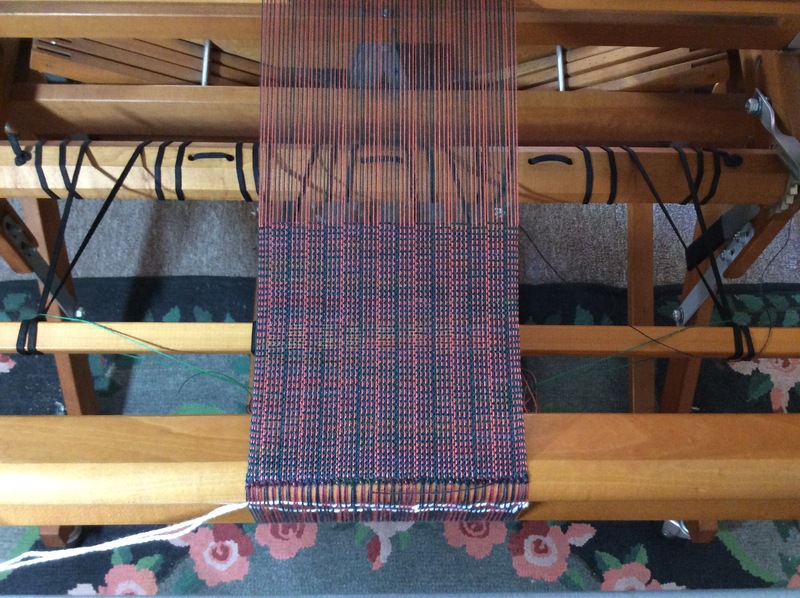 As soon as I free up a loom I’ll be starting a tencel birds eye twill scarf for my friend Nancy and on the other will be more tencel scarves to be sent off to galleries in Montpelier and St. Johnsbury. 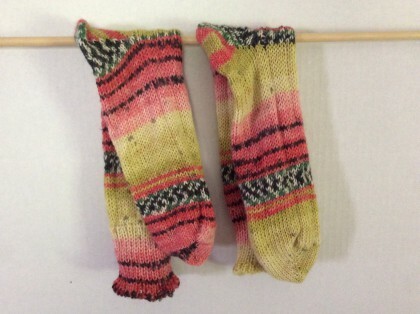 The sock shelves are looking very bare, so there will be cranking. And I have a sweater to start for a client. Hoping for a lovely, productive week. There’s a lot to do, but I’m feeling energized from that extra hour we got over the weekend. I’m sure I can make it feel more like a gain of 2-3 hours. It’s been a busy week here in the studio. A fellow weaver asked me if I was freaked out at the fact that Vermont Sheep and Wool Festival is in six weeks. “Not at all” was my reply. Then I thought about what she said and realized “heck yes!”. I’m nowhere near ready for it. This is my first year having my own booth (as opposed to sharing.) So in addition to making socks and scarves to sell, I need to design my booth layout. I’ve wanted a bar-height director’s chair, which I purchased this weekend. I’m pondering hanging displays for the scarves, what tables I want to use and thinking about different promotional materials to advertise my services. Soon I’ll set up the tent in the yard and do a dry run. If you are at all nearby please plan to visit the festival. 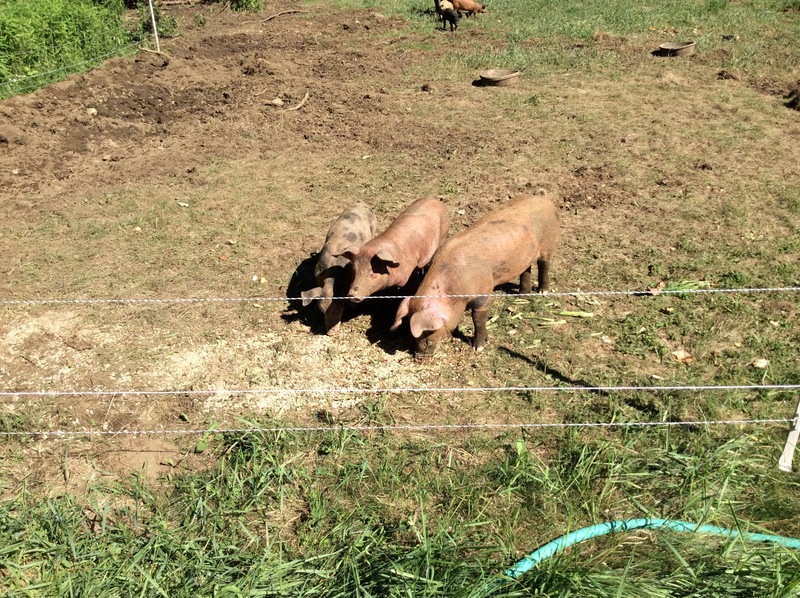 It’s October 3-4 at the Tunbridge, VT Fairgrounds. I’ll be in the vendor pavilion. I’m now on Instagram! Not sure I know what I’m doing yet, but I expect I’ll figure it out eventually. A week filled with many different projects, from packaging up completed projects for shipping, to creation of new. 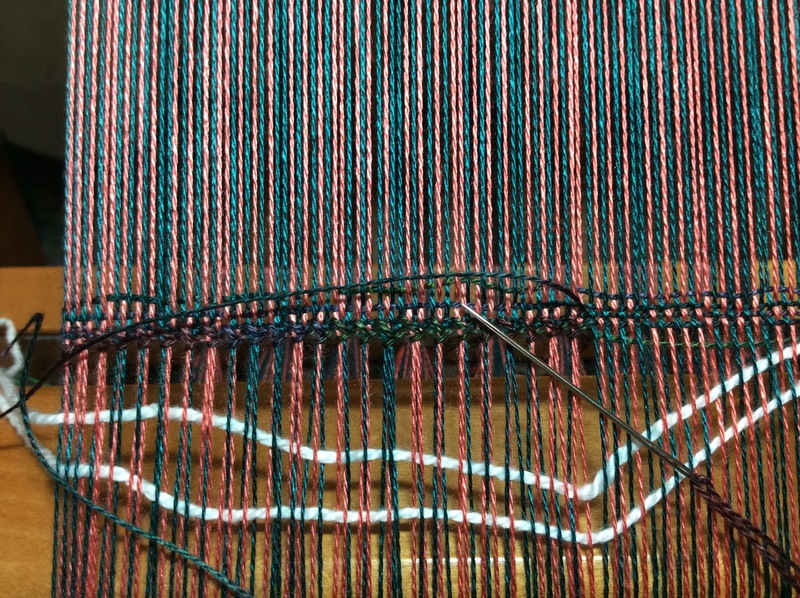 Knitting, weaving, planning. Some days I’m head down, intensely working on one project. Other days I need to make progress on many fronts. 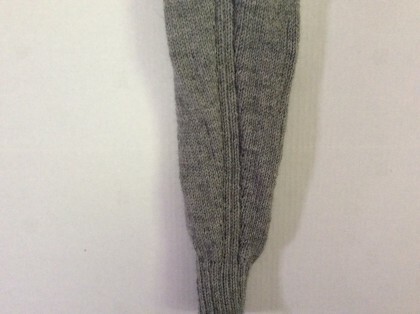 This is the gauge swatch for a scarf commission. With this I’ll learn about the pattern and figure out whether I chose the correct needle size. 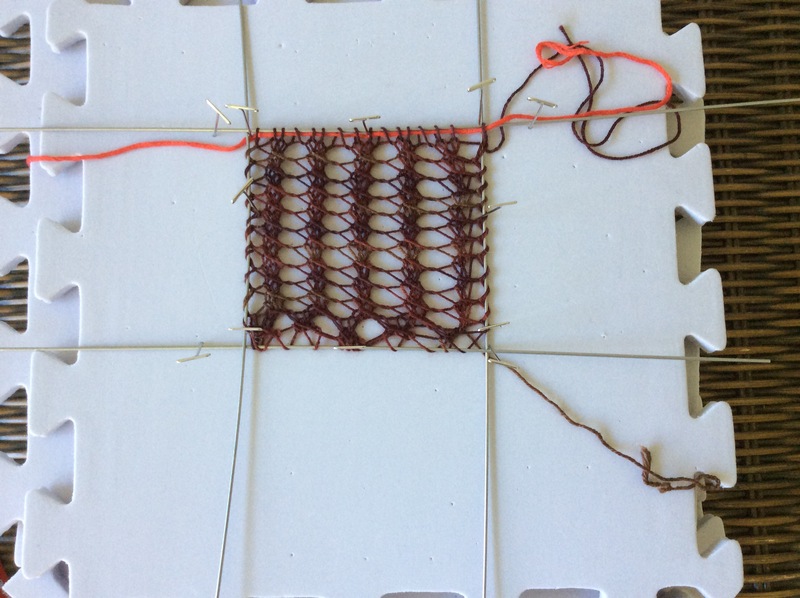 You wouldn’t think a two-row lace pattern, with complicated bits on only one of the rows would be difficult. I blame the early hour and not enough coffee for having to rip out the whole thing once and un-knit a few stitches more than once until I finally managed to start with and keep just the 16 stitches I was supposed to have (no, not 15, not 17, 16 if you please.) I won’t know if I’m right about the needle size until it is dry and off the blocking wires, so this project is on hold for now. 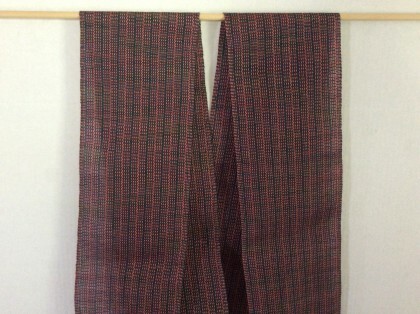 This neckerchief was recently finished. It has been washed and is pinned out to dry. 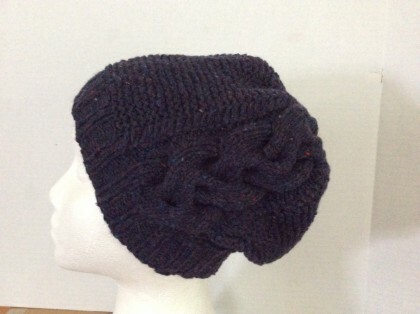 This is for the same client as the lace scarf. 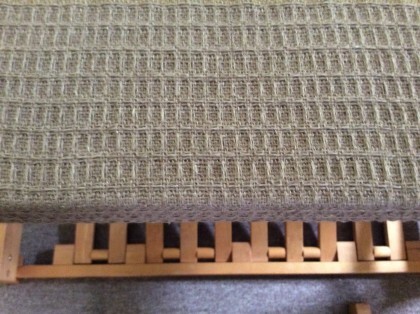 Taking off the knitting hat and putting on the weaving hat, I have two looms set up with projects. 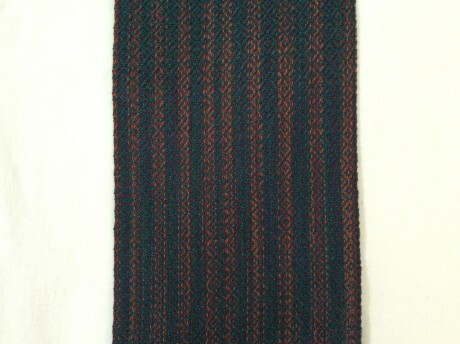 This is a tencel scarf with a striped warp and a variegated weft that is very close in shades to the warp yarns. 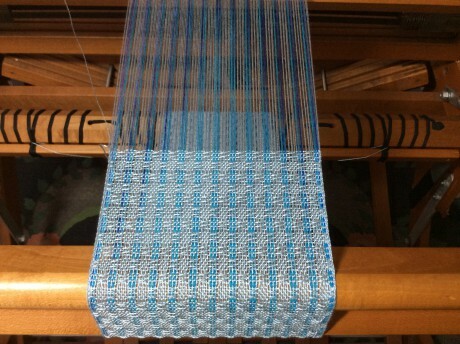 It’s just plainweave, set (spaced) loosely to make a sheer, drapey scarf. And finally dishtowels. 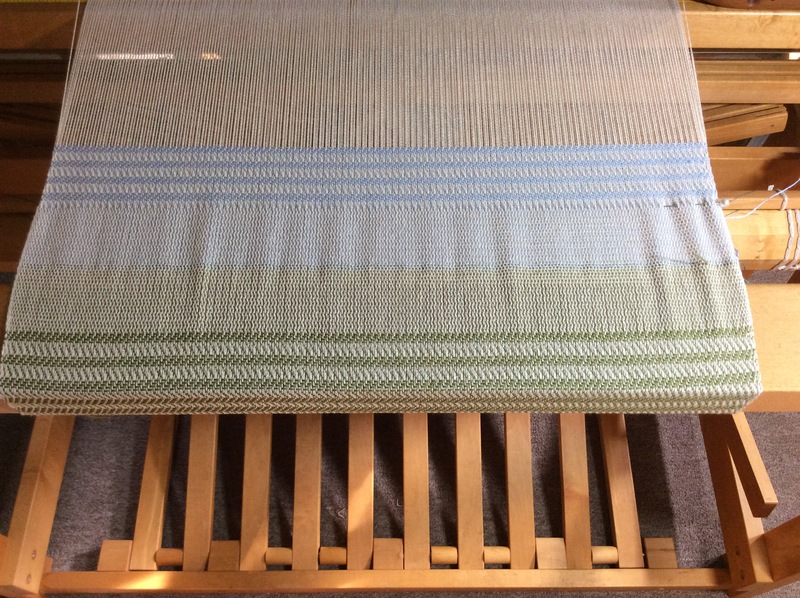 You can see the end of towel #6, green stripes and the beginning of towel #7 (of 8 on this warp), blue stripes. 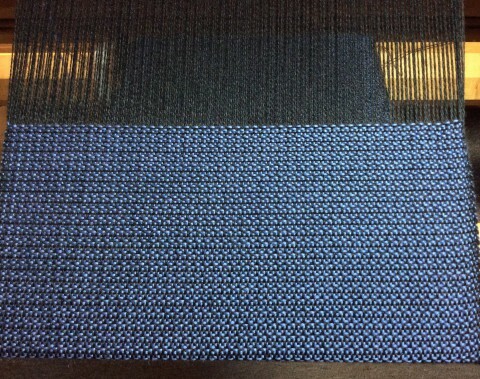 The plain bits in the middle are the hems, with a cut line in a contrasting color separating the two hems. The tencel scarf and the dishtowels will be added to my shop inventory. It is bright and sunny, but a mere 8 degrees out and the wind is still whipping around the corners of the house. This month has been brutal, though thankfully we were spared in the weekend snow storm and only got a few inches. On the knitting side of the business I’ve been filling orders for pedicure socks, working on a sweater commission and I’m close to finishing a batch of hats for Carrie Cahill Mulligan. 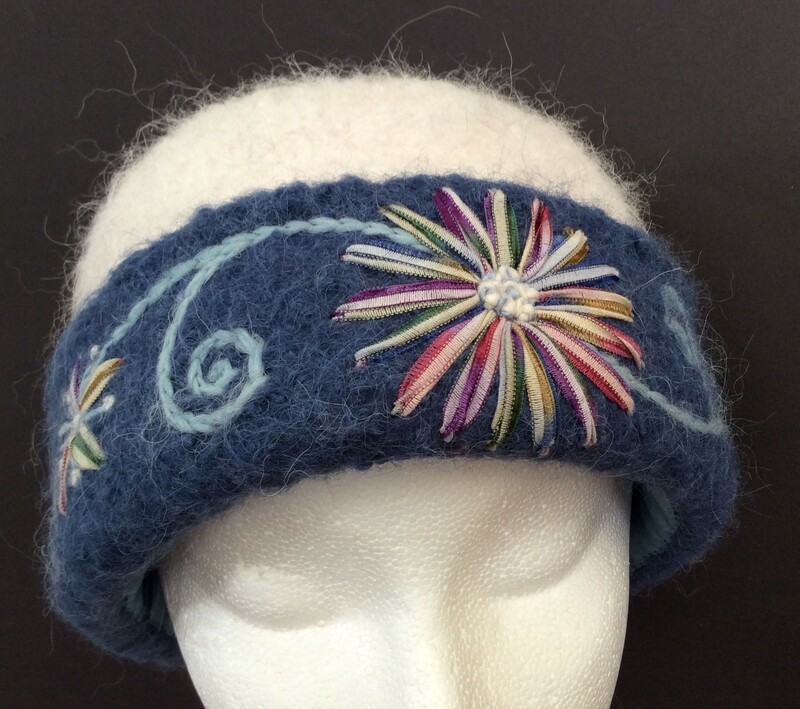 I knit some hats for her, she does all the hard work of felting them and adding the stunning embroidery. If you don’t have one yet, you should definitely treat yourself. They are so warm and keep out the cold winter wind. This is mine and I wouldn’t part with it for anything! 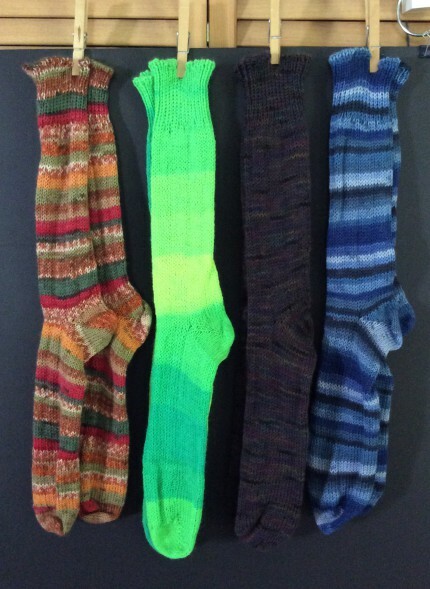 Author Jennifer KortfeltPosted on February 16, 2015 Categories Heron Pond, Knitting, WeavingTags commission knit, knitting, pedicure socks, weavingLeave a comment on Brrrrrrr!